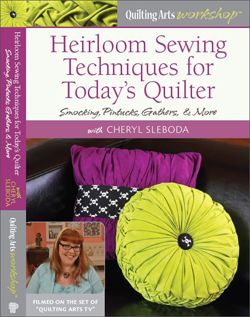 blog – Page 173 – Cheryl Sleboda – Textiles. Technology. Texture. Teacher. I had this idea in my head for a while, and decided to make it for a custom trade I was asked to do with somoene from ATCards.com. Click for a better view. I’m looking forward to making more, as the peas are stuffed trapunto work. I finally got all of my artist submission stuff back from European Papers. Didn’t make the poster, or win a prize. Bummer. But, at least I entered what I thought was a fantastic work. I am going on retreat again in a week and I have a whole host of things to do for custom trades, swaps, circle journals, round robins, and something new called a “jam”. The Jam works when one artist starts the work, and makes 3 sets. Then the works are sent to a second artist, who works on all 3, and then sends them to the next artist, who works on all 3, then mails one each to the first two artists. I was sent a Jam for a circle journal page (all 3 of us are the the fabric circle journal round robin) and also an ATC jam was included. Lots of fun stuff. I did some non-quilty projects along with some more trading cards and journals. These are matchbox shrines done for a swap. I am going away on another retreat in Nov., so I will get lots of work done there. The journals are 6×6 inches and sent all over the world, the page with the geckos below is one made for one of the fellow artists. I have been paticipating in fewer swaps in anticipation for the holidays, knowing I won’t have the time commitments, among other reasons. The swaps haven’t been as “fabric friendly” nor have my returns been on time or something I expected, so I’m just cutting back. Did some wool felt beads and got back to making some kanzashi flowers. I need to get back to sewing during my lunch hour, away from my desk again. I miss that. I also need to seriously update my quilting pages of www.muppin.com. We saw Mozart’s Requiem on Saturday and it really inspired me to find a good recording of it and use it to fuel some quilt work. The shrine I am working on is coming along, the beading is next, and there’s a lot to be done. I want it to be “encrusted”. I have had scarcely enough time to breathe, but I can find time to quilt. I was away in Alaska on a cruise, been uber-busy on the job, and things at the house are a mess. During all of this I have been able to get my quilt for Quilting Arts mailed as well as finish off a bunch of ATCs for swaps. I was invited to a quilt retreat in Pennsylvania the weekend after the cruise (last weekend), and through a rotten cold caught on the plane from Seattle, I was able to finish a circle journal page for my own Circle Journal that was mailed to Australia, but also finished my “precious fabric” round robin starter. I decided to do a fabric journal, in which each participant would do a set of pages, or one “signature”. I chose my hand dyed fabrics as my precious fabrics. It was hard to cut them up. I also finished about 10 ATCs for swaps. Now I have someone elses’ round robin and someone elses’ circle journal to finish this month, as well as about 5 swaps before the end of the year. I finished these ATCs today. I love how old tombstones say “Sacred to the Memory of…” on them, cemeteries are so often forgotten, but are there so you always remember the people in them. I wonder sometimes if the people there are upset that no one remembers who they were. My husband lost a good friend this past week, so this set of ATCs was a bit theraputic. Both of my checks for QA magazine and the European Papers’ ATC show have been cashed. Hooray! Sounds dumb, but that means they are both in. I wish I could go to Houston for the big Quilt show, but it is always Halloween weekend, and this year is an important anniversary I don’t think I can miss. 😉 However, I am saving my pennies for the show in Chicago in April. I can’t wait to go! Sep 03, 2006 Muppin Comments Off on What am I getting myself into? I am hosting this week’s International ATC Month Week 1 challenge on fabric ATCs. Monday, I’m hosting a chat class on how to make them. I spent today making some non sewn ATCs. This one I am keeping for me. I burned the heck out of my fingers making this damn card. I made some cards that were hand sewn, and also some catds that were painted, stamped, and drawn, so that each person could use their art on fabric somehow. I also need to get some “texture” squares done for the Off Kilter Quilter group. They have to be 6″. Which is not too bad. I’m in desperate need of more plain black fabric, and some white as well, in order to start these projects, and to have on hand. I also need to go back and update my posts that have the pictures missing, and maybe update the quilting pages as well. I have a vase and two purses to post (one I made today) from the Tammy Tadd pattern I bought in Chicago. I was invited to go to a retreat with my round robin friends in a camp north of Harrisburg PA Sept 29th – October 1. This is right after I get back from Alaska, but I don’t care. I joined right up! Hopefully I can use that opportunity to get some projects done! !